Treat-to-target has been a guiding principle in some types of medical care for a long time. In heart disease, targets for blood pressure or cholesterol levels are easy to measure regularly, and your medication may be changed or increased in dose until you reach levels that are less risky for your heart. 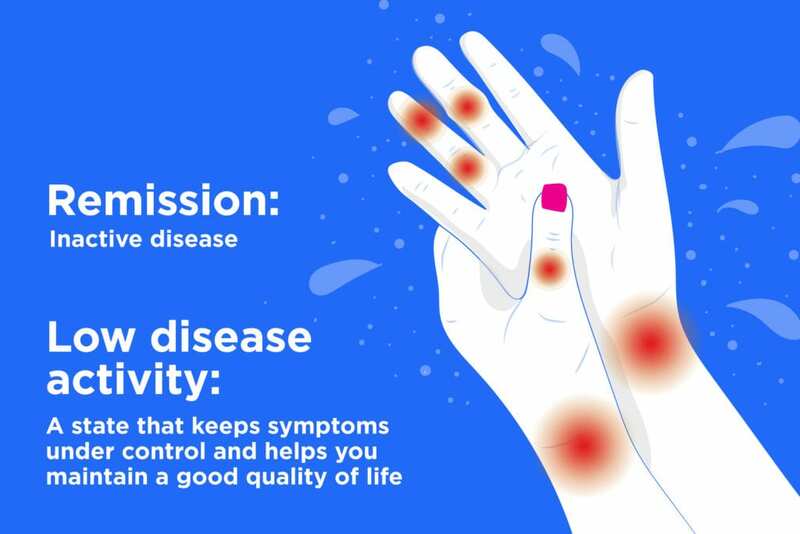 In rheumatoid arthritis (RA), the concept of treat-to-target has been used for disease management since disease-modifying anti-rheumatic drugs (DMARDs) made it realistic to achieve remission (inactive disease) or low disease activity (LDA), a state that keeps symptoms under control and helps you maintain a good quality of life. But the “target” in treating RA can’t be monitored as simply and objectively as a blood pressure measurement or cholesterol test. Your symptoms, opinions, and goals as a patient are actually a big part of the process. Here are some common questions on achieving the results that matter to you in a treat-to-target world. You can talk about these with your doctor as part of the shared decision-making process. Is rheumatoid arthritis remission always the target? “The target is typically remission, but some patients will never achieve remission and the target should be low disease activity. Patients have a large role in deciding on their target,” says Daniel Solomon, MD, MPH, professor of medicine at Harvard Medical School and chief of clinical sciences in the division of rheumatology at Brigham and Women’s Hospital in Boston. Your role: First, don’t put off seeing a rheumatologist: “Remission is most easily achieved among patients with a relatively short duration of RA, usually less than two years. Patients with a long duration of disease may have pain that will not respond well to immunosuppressive treatment, and for them, low disease activity may be a more appropriate target,” says Dr. Solomon. Besides the duration of RA, a McGill University study indicated that weight control and smoking cessation can also make remission more likely. Second, talk openly with your doctor so you can set a target together. “People have varying risk thresholds. Some are comfortable with low disease activity and are not willing to increase their medication to get further benefit. Others are willing to escalate their care until they are in remission, if possible,” says Liana Fraenkel, MD, MPH, adjunct professor of medicine at the Yale University School of Medicine and director of patient centered population health services at Berkshire Health Systems in Pittsfield, Massachusetts. How much emphasis is there on blood tests and imaging to monitor my progress? Maybe not as much as you think. Various assessment tools are available and may use physical exam (the number of swollen joints and tender joints), blood tests that measure inflammation (C-reactive protein and erythrocyte sedimentation rate), and patient ratings of their pain and function to come up with a score that is tracked over time. “Some measures rely solely on patient report of pain, disease activity, and limitations in function,” says Dr. Solomon. If monitoring indicates that your disease activity is moderate or high on your current medication, your rheumatologist may increase your medication dose or change your regimen. Treat-to-target doesn’t dictate specific medications or doses to be used. Your role: Report how you’re doing to your doctor, not only in terms of pain but how you function in daily life. Have there been changes in doing things that used to be difficult, such as opening jars or getting dressed? How are you functioning at work? Can you get done what you need to during the day? How tired are you? If a certain activity used to bring on a flare, is that getting less or more severe? “We now aim for patients to be much more active, so we want to know about your ability to participate in more vigorous activities, including exercise. It’s important to set goals and let us know your progress in achieving them. It’s also important to discuss how you’re tolerating your current medication and whether you’ve had any problems either taking it or getting access to it,” says Dr. Fraenkel. Although the hope is that you’ll feel normal and won’t have more than fleeting symptoms once you’ve reached remission, some people continue to have low levels of pain or swelling, Dr. Solomon says. Will my doctor lower or stop my medication after I achieve low disease activity or remission? Probably not right away. “Before tapering or stopping a DMARD, whether methotrexate or a biologic, we like to see patients in low disease activity or remission for several to many months before tapering. Prednisone is different: We don’t like to keep patients on it any longer than necessary,” says Dr. Fraenkel. Your role: For now, there aren’t evidence-based predictors of who will do fine and who will flare again if drugs are tapered (about 50 percent do), says Dr. Fraenkel. Decisions about whether and when to taper is very individual and, in her practice, based almost entirely on what the patient wants to do. “Some patients remember being very ill when they started medication, and once they’re feeling better don’t want to touch them. Others can’t wait to get off their meds,” she says. Will getting to low disease activity or remission improve my long-term health? Besides feeling better now, which is a big part of how your rheumatologist will determine you’re meeting your target, there’s growing evidence that your overall health should be better for years to come. “Tight control of disease results in decreased radiologic progression and better function in both the short and long term. This is especially true for patients who are treated early. We don’t have long-term results of the treat-to-target studies showing their impact on the need for joint replacement, but there is evidence that better treatment of RA — in large part due to biologics — has led to decreased joint damage. There are some studies showing that treatment leads to a lower risk of cardiovascular disease,” Dr. Fraenkel says. Your role: Talk openly with your rheumatologist about your function, pain, and medication side effects. Working together, if needed you can tweak your regimen to keep you on the path toward your target and a healthier future. Ankylosing Spondylitis: What Is It, and How Is It Treated?